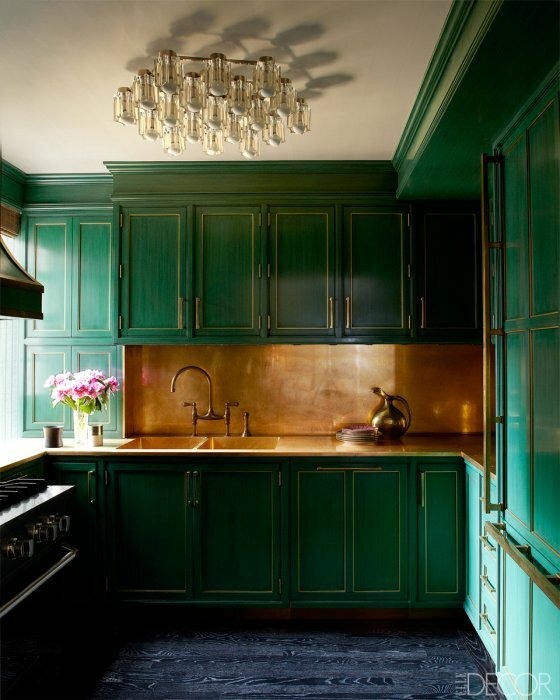 I had never even heard of the term “cerused” until I saw the Cameron Diaz’s green kitchen designed by Kelly Wearstler. You know the one. It’s the kitchen that has inspired the direction for my own kitchen and my plan for green cabinets. 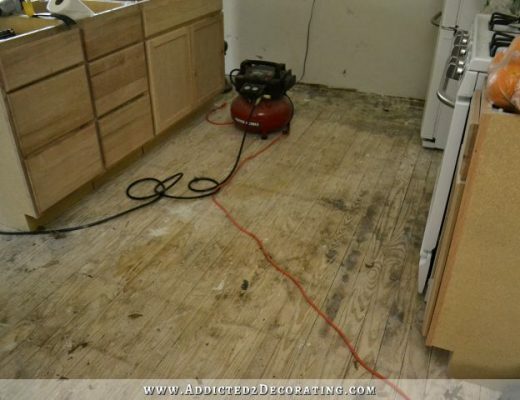 Of course, the cabinets were the first thing I noticed, but those floors also caught my eye. I thought it was some kind of faux bois technique, which is simply an artistic representation of wood and wood grain created with paint, stain, pen, pencil, etc. But I wanted to be sure, so I went searching for info. In the Elle Decor article, the description on this picture said that the wood floors had been stained with an ebony stain, and then they were cerused. Cerused? I had never heard of that, but I wanted….nay, needed…to know more. Turns out cerusing is the process of opening up the grain of the wood and filling it with a color (most often white) in order to highlight the grain of the wood. Obviously the darker the stain used as a base color, the more that the white grain will stand out. The lighter the stain used as a base color, the more subtle the cerused grain will be. The floors in Diaz’s apartment were stained ebony. That’s about as high of a contrast as you can get — ebony stain with white cerused grain. 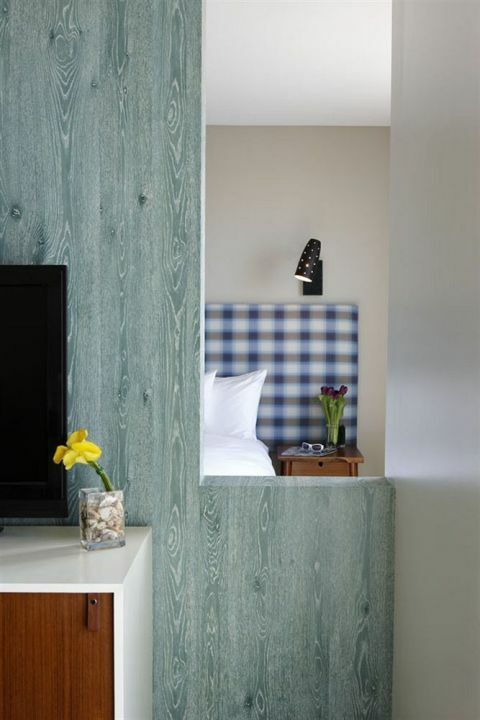 Here’s an example of a light blue cerused wood wall from the Shorebreak Hotel in Huntington Beach. 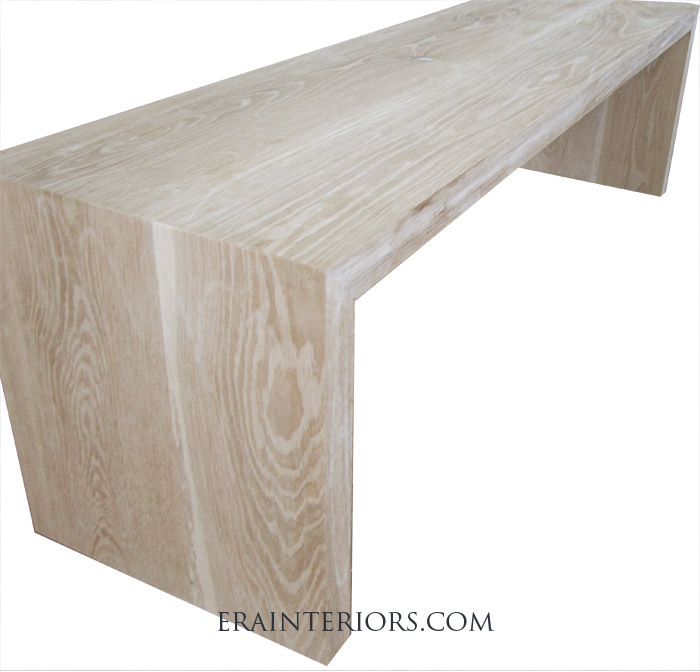 And here’s a coffee table from Era Interiors with very light stain (or perhaps that’s just the natural wood color). Obviously the contrast is more subtle, but the effect still turns the grain into artwork. So after learning all about cerused wood, I’ve been anxious to try out this technique on my own. From what I’ve read, it works best on hard woods such as oak, and it just so happens that I have an oak dining table that I bought on Craigslist I’ve been wanting to refinish. And while I’m generally not a fan of oak with all of its heavy grain (especially oak like this table that has such a strong orange color to it), and while I’m generally one of those people who tries to minimize the look of grain in wood in any way I can, I do actually love the grain in this particular table. 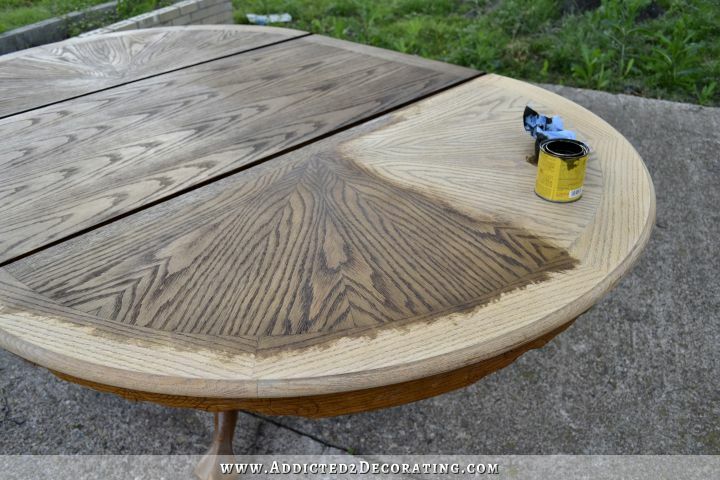 Whoever crafted this table went to great lengths to turn the wood grain into a work of art. So I thought this table would be the perfect candidate to try out this cerusing technique. The table actually has a leaf also, so I put it in so that I could refinish the whole thing. I didn’t get to the actual cerusing yesterday, but at least I was able to remove the old, ugly orange finish and get some pretty stain on it. I started out using a chemical stripper (the same one I used on my hallway door) because with old pieces of furniture like this one, you just never know how thick…or thin…the veneer is. And almost always when you have a decorative pattern in the wood like this, it has been created with veneer. So I used the chemical stripper in order to minimize the amount of sanding I would have to do on the table top. After getting most of the finish off with a chemical stripper, I followed up with my orbital sander using 150-grit sandpaper. You can see the difference the sanding made here. And by the way, almost immediately on one tiny section I did, in fact, sand completely through the veneer. So I was very glad that I had decided to use the chemical stripper first, and I used extra care in sanding to rest to be sure I didn’t sand through the veneer in any other areas. After sanding the entire top, I used a brass wire brush to scrub the entire top with medium pressure going with the grain of the wood. This is supposed to open up the grain so that it can be filled with the white wax or pigment later. I couldn’t find a large brass wire brush. 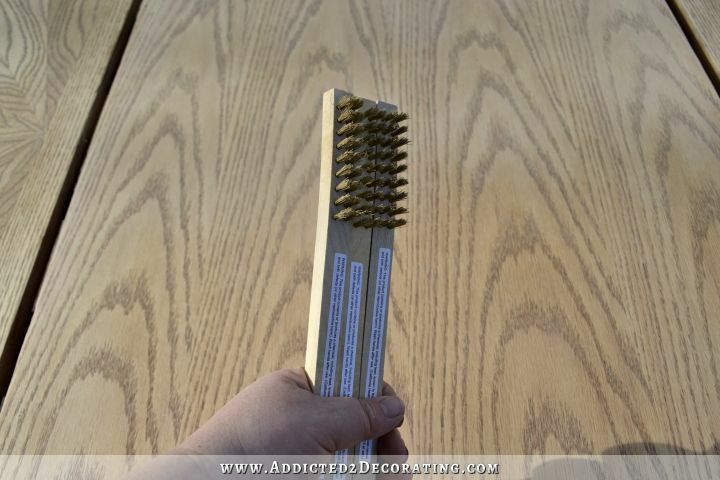 All I could find were these brushes in the welding section at Home Depot. So I bought three of them (they were just over $2 each) and used all three together to create a larger brush. So this is as far as I’ve gotten on this project. As you can see, I haven’t done anything to the apron or the base yet. Those are still the awful orange oak color. I didn’t want to ceruse the entire table (I think that would be overkill, so I’m just keeping it to the top), so I’ll be painting the apron and the base a solid color. But I want to get the top done before making that final decision. I can almost guarantee that I’ll end up painting it white, but I’ll know for sure as soon as the top is done. UPDATE: I worked all afternoon on the table, and wanted to show y’all an “in progress” shot of the cerused table top. I love it!!! I had my doubts for a while that it was going to turn out, but I just kept at it, and this gorgeous grain finally appeared. I’ll share all the details on Monday. 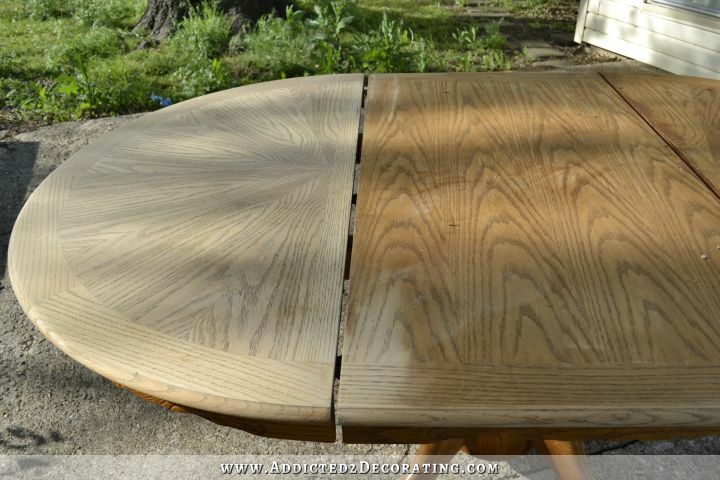 Next Post Cerused Oak Dining Table (Table Makeover) – Finished! Well, I am a wood grain person, so I’m interested in how this turns out. 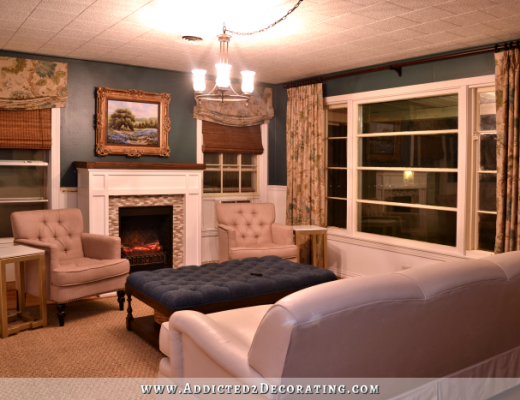 I’d love to see the base in a bright color that isn’t anywhere else in your home. Bright yellow? 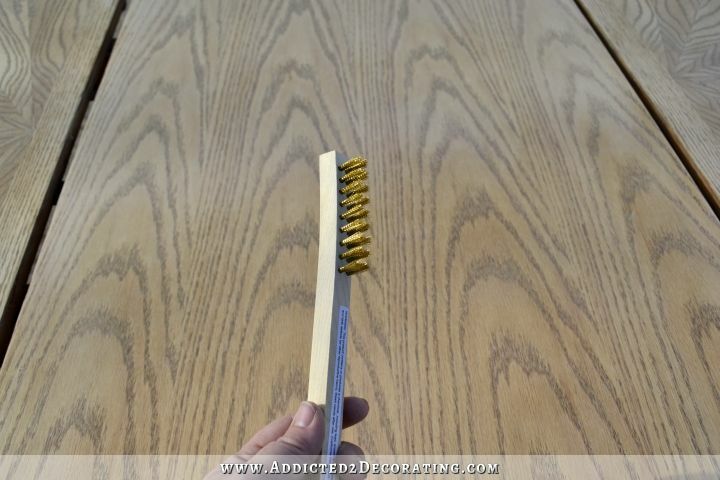 You can find larger brass wire brushes in the BBQ section of Home Depot, Lowes, or even Target. They are for cleaning your grill, but can be used for other projects too! Wow! What an amazing improvement over the orange! I too love to cherry pick clever ideas from many sources. Hey! Why reinvent the wheel? Someone went through a lot of training to develop these great ideas. Imitation is supposed to be the greatest form of flattery! You Go, Girl! I love your work, and look forward to your blog everyday. Wow! Oh I can’t wait to see the finished product! I actually used to have that exact table, complete with the leaf. And I sold it on Craigslist some years ago. Maybe I should have kept it! I, too, am a wood grain person. I think wood grain is nature’s art all by itself. I find it interesting when someone exhibits different tastes and viewpoints because it opens m eyes up to ideas I never thought of. That table is gorgeous! I cannot wait to see how it turns out. You always do a good job Kristi! OMG that is going to be gorgeous. Depending on how it looks on Monday, my search for a new table will begin immediately! Thanks for the lesson on cerused wood. I may have to try this myself! I had my doubts but now I think it’s really cool! Can’t wait to see finished product. I’m a wood grain person also but I do love a good painted piece of furniture. I’m excited to see this new technique. I have no doubt it’s gonna be fabulous!! I’m so impressed by how quickly you move from idea to underway to all finished! I have ideas but then my projects sit in my basement for months…. I’ve usually been drawn to low-contrast cerusing, so I’m eager to see how this higher contrast version will work out! I love the grain in this table and the stain is gorgeous. I’m anxious to see how the next step turns out. You just solved a major quandary I was having! I have an oak dining table that I hate but I absolutely loved the white finished coffee table you used in the example 🙂 Thanks Kristi for all the inspiration! So basically it’s a resist or a sort of “Batik” for wood… That.is.awesome! and again you amaze me! I woudln’t have thought it possible that you can get rid of that horrible orange wood colour with so little steps and such great results! Let me make myself clear: little to you – massive to me 🙂 as it would have taken me ages to decide and get going and then get the table done! It’s very beautiful already and I’m looking forward to Monday! The idea of painting the rest of the table is great, too, because you’re right, it can do with some more quiet as the top is so vivid already. Fantastic job (as always!! ), thanks for sharing! Thank you for all you teach us on your blog–love it!! 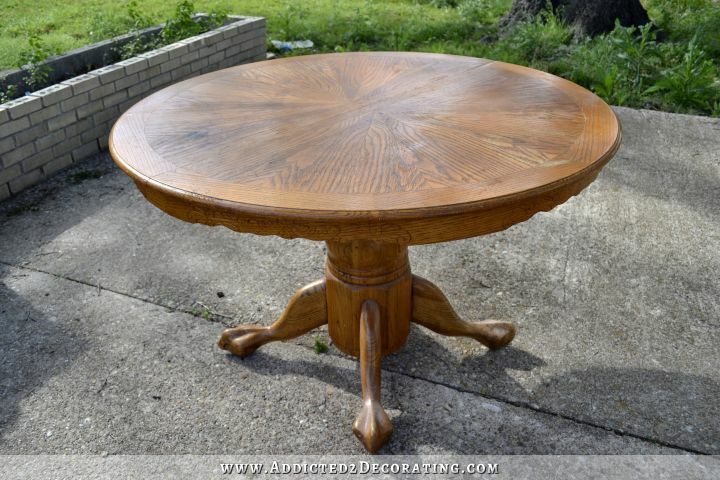 Would you please consider including your thoughts on final finish for a dining table? 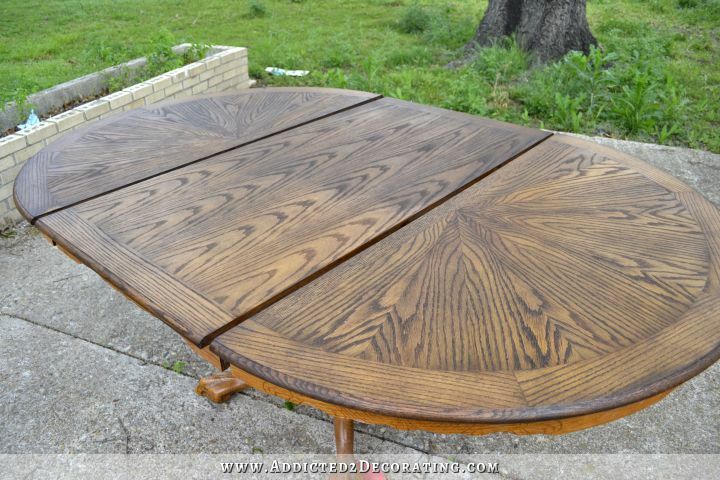 I would like to help my sister refinish her wood kitchen table, but I don’t feel settled at all as to what the best topcoat is for a used and abused surface like that. I’m looking to wind up with a surface that can handle perspiring glasses and be cleaned of stray crayon marks and fruit roll-ups. If you can, great. If not, I do understand that you have tons going on. I thought it was so funny that someone remembered your neighbor from the condo who gave you such a hard time about your work noise! I’m laughing now as I remember it. So happy you can work in peace now. I like the idea of cerused wood. And I also liked someone’s suggestion that you pain the rest of the table yellow. I wouldn’t have thought of that. Or you could paint it to match your cabinets. I also have an oak table in my kitchen, but for the last 20 or 30 years I have kept it covered with a cloth tablecloth because I feel a kitchen has too many hard surfaces, and not enough fabric for softness. I love using a tablecloth as my mother always did. And surprisingly, my husband is very adapted to it. His mother always used oilcloth, but I won’t go there. Excited to see you finishing a smaller, pretty project for instant gratification. I can’t wait to see the finished results. I have two oak side tables that I have had for years. One is repurposed in my office and my printer is on it and a spot for the puppy to sleep underneath. Love to find ways to update and still continue to use them. How funny, Kristi! I asked you about refinishing a damaged table and you were sweet enough to respond to me on January 17, 2014. You recommended using Zinsser primer to fix a mishap of sanding through the damaged veneer top. The table I was working on to chalk paint a Tiffany Blue color is THIS exact same table. I couldn’t believe it when I saw your post and recognized the table. I can’t wait to see your end product. I’m still working on mine, but hope to be finished this weekend and to find someone’s beach home for my table. Thank you for your willingness to share your knowledge! Love the table. I like the idea of Cerused Finish. I have never heard of it before. In looking at Cameron’s beautiful kitchen . The light is fabulous in this room. The light that your Hubby bought you will look great over that finished table. Look forward to seeing the table finished. Count me too as someone who has this table too. Hanging my head in shame after seeing what you have done, it is gorgeous! Wow, I’m amazed at how much more detail comes out with cerusing (is that a valid form of the word?). The table top is gorgeous- I see designs in it I couldn’t see with the original stain. I love it! My dad does beautiful wood working and so I think wood grain just makes a piece. Lol. And you’re right: The person who made the table made the grain into a work of art! Wow, just saw your update with the cerused section, it really does look like a piece of art! Wood is art! My dad made furniture and I always watched so later I could sand and refinished pieces myself. You are super talented. Someday I would love for you to write about your time in Istanbul. I’ve only been to Mexico City. Kristi, the table top looks amazing already, and you’ve barely begun! 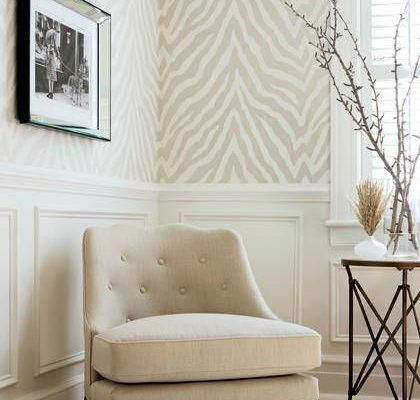 The cerused wood grain looks like giant feathers laid out in a pattern to me, just gorgeous! I’m not that much of a wood grain person myself, I prefer more subtle woodgrains. 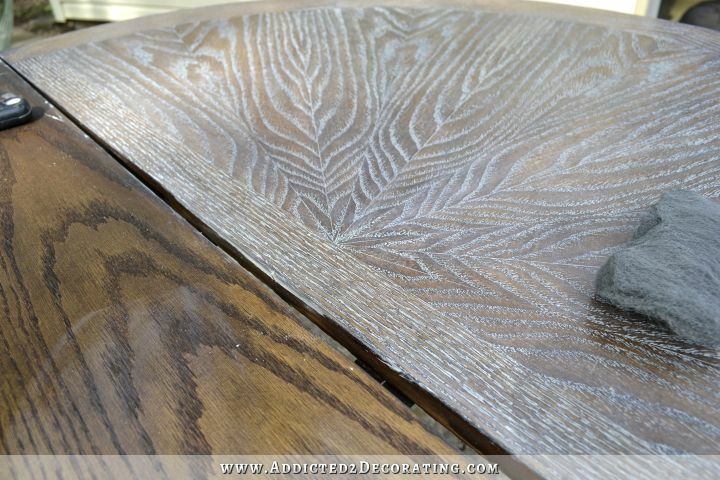 This grain pattern in this oak table top is anything but subtle, especially with the cerusing, and I just LOVE it! I’m going to have to rethink my stance on woodgrains. Cannot wait to see the finished product! Also got a chuckle over someone mentioning that horrible old neighbor of yours who used to complain about the power tool noise, I’d almost forgotten about her! Thank goodness you don’t have to worry about snarky neighbors like her anymore! Just saw the update. I love it. Great job! How COOL is that!!! I have a similar table whose finish us coming off. I have been hiding it with a table cloth. Can’t wait to hear more details and see the finished product because the update looks so neat! I can’t wait to see the entire thing finished. We have an orangey oak table that I absolutely can’t stand and my husband is in the “you don’t paint wood” camp. This is something I might be able to convince him to let me do. I really love the look. WOW!!! That looks beautiful. Just logged in this morning and saw your update, it is awesome. LOVE LOVE LOVE IT!! Home Depot carries Varathane stain. Varathane is a Rust-Oleum product. I just wanted to mention that in case it helps for future projects. The table is looking fabulous. Look forward to the final reveal. I adore painted furniture but I’m so glad that you are preserving the craftsmanship in this piece! Can’t wait to see the finished product! Kristi! You have the table of my dreams- sort of, it’s the feet that I love. I’m not crazy about the sunburst grain newer reproductions have, it’s a little too country for me- but! you’re making it beautiful. I didn’t think that the look would be my style but, after looking at your preview, I think it might just look amazing in my black & white kitchen. I can’t wait to see the whole thing finished. Thank you for inspiring me and giving me another option (for a really good price). What an amazing improvement over the orange! I too love to cherry pick clever ideas from many sources. Love your work, and look forward to your blog every day. That table is gorgeous! Looks beautiful. I may have to try this myself! You always do a good job Kristi! Kristi the finished table is really beautiful. I have a old tea trolley and would like to Cerused it. Hope I can locate, similar product here in Australia. As I say you are truly an inspiring person to gain confidence to tackle projects. Wow! I love that look. Is there an update for this table? 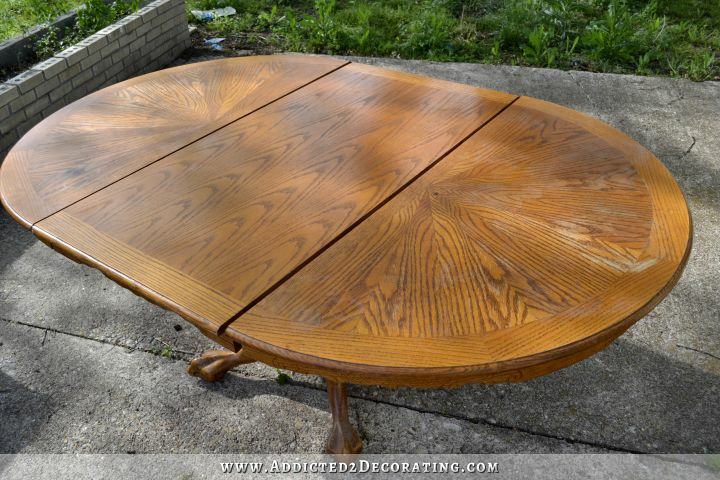 I have literally the same exact table I am refinishing and I really wish I had seen this BEFOREHAND staining it. I’ve never heard of cerused either so maybe next time. I have this exact table and the veneer is ruined (chipped off) in a spot in the edge, any way to fix this? This table is beautiful! 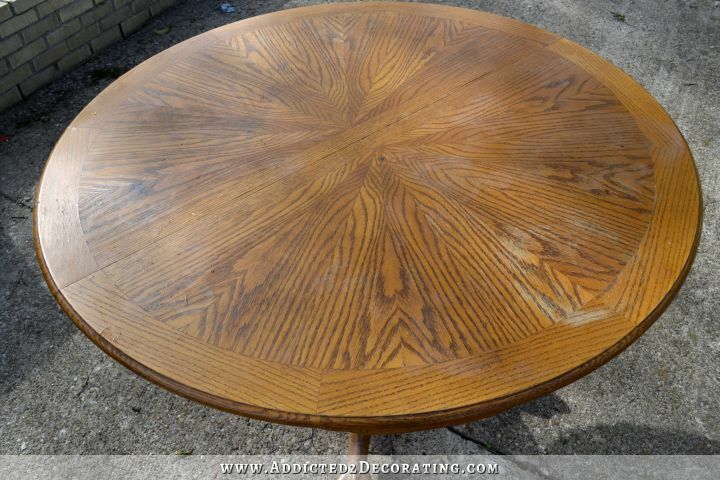 I wonder how common a table with that wood grain is.? I would love love love to find one just like it and use your tutorial.